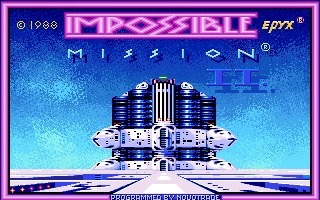 Impossible Mission II is the sequel to the first Impossible Mission game and was developed by Novatrade Software and published by Epyx in 1988 for the Amiga, Apple II, Commodore 64, and others. 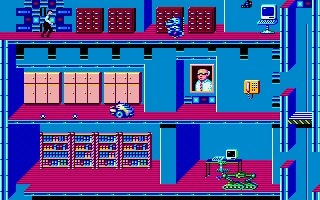 It was also ported to NES in 1989. Picking up just after the conclusion of the original, the previously foiled baddie Elvin Atombender is back for revenge. The game takes place inside the lair of Mr. Atombender as you try to make your way through his multitude of towers to stop his evil plan. You do, however, have a time limit of just 8 hours in which to do this. Utilizing a similar play style as the first one, it plays as a side scrolling platformer, but does not recycle any of the code from the original. Built from scratch, IMII adds new robotic enemies as well as new bombs and mines to help you forge a path to Atombender. Along the way you have to collect a set of musical keys that go together to unlock the elevator to reach your target. But be careful, some of the pieces are duplicates and you have to make sure you record over them with a non-duplicate key. 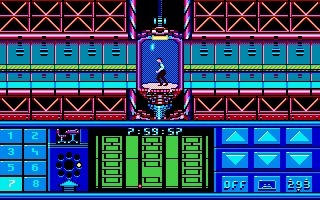 Impossible Mission got somewhat mixed reviews upon release, but the majority were positive. It even went on to snag an award for “Best Dexterity Game” in 1988. Though a tad frustrating without a save feature, it’s a classic platforming experience. Love it? Hate it? Let us know below.